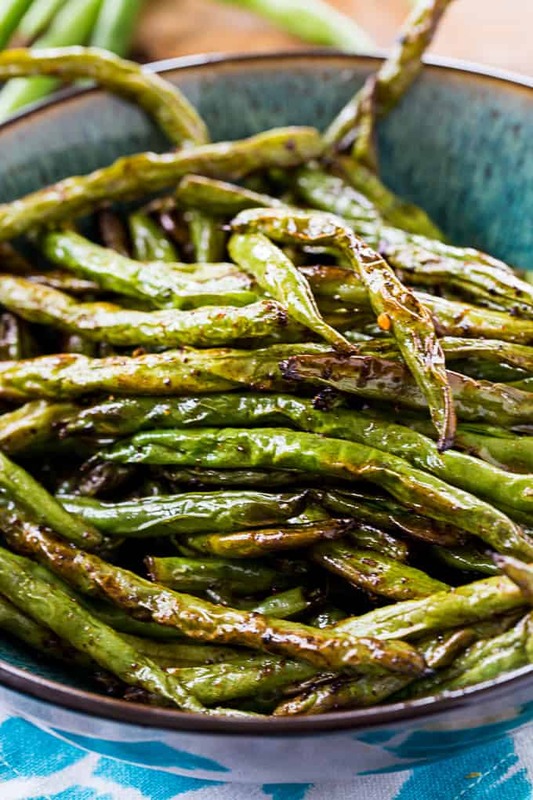 Air Fryer Asian-Style Green Beans take just 8 minutes to make and have so much flavor. It’s a low carb, vegan, and gluten-free side dish that’s so delicoius you’ll want to eat it as a snack. 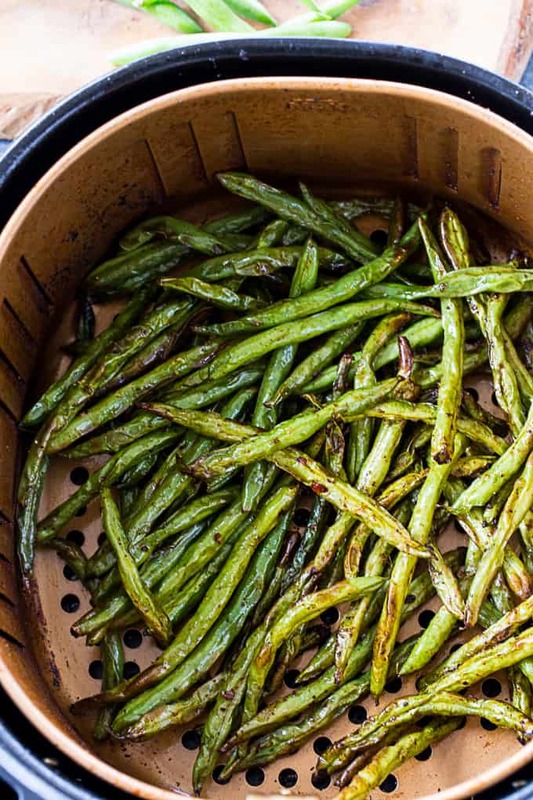 These Air fryer Asian-Style Green Beans are a great alternative to steamed green beans. I don’t know what it is about roasted vegetables, but they are so good. With the Air Fryer, you can get all the flavor of roasting vegetables in a fraction of the time. The Air Fryer is ideal for mkaing healthy recipes. You can cut way down on the amount of oil and they still get wonderfully crispy. To make Air Fryer Asian-Style Green Beans, fresh green beans are tossed with sesame oil, soy sauce, rice vinegar, garlic powder, black pepper, grated fresh ginger, and red pepper flakes. Let them marinate a few minutes and then Air fry them for 8 minutes. They get wonderfully crispy and have lots of spicy, salty flavor. 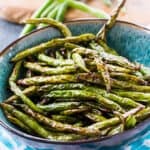 Air Fryer Asian-Style Green Beans take just 8 minutes to make and have so much flavor. It's a low carb, vegan, and gluten-free side dish that's so delicoius you'll want to eat it as a snack. Whisk together first 7 ingredients in a medium bowl. Add green beans and toss to coat. Let sit 5 minutes. 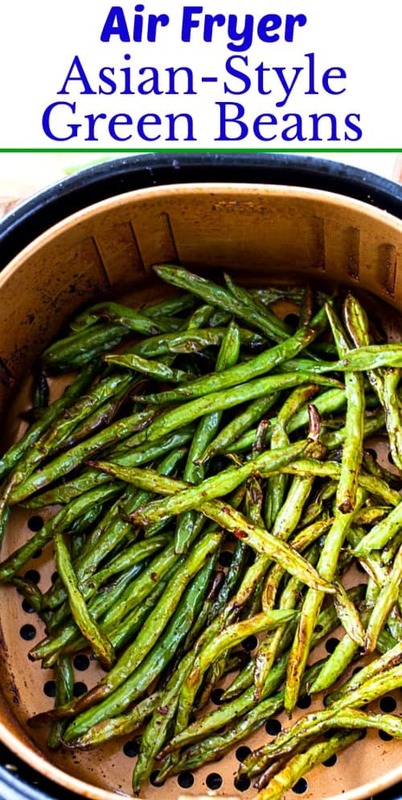 Place half of green beans in Air Fryer basket. Air Fry at 390 for 8 minutes, opening and shaking the basket halfway through. Repeat with remaining green beans. Nutritional info is provided as a guide only and can vary based on brands of products used.